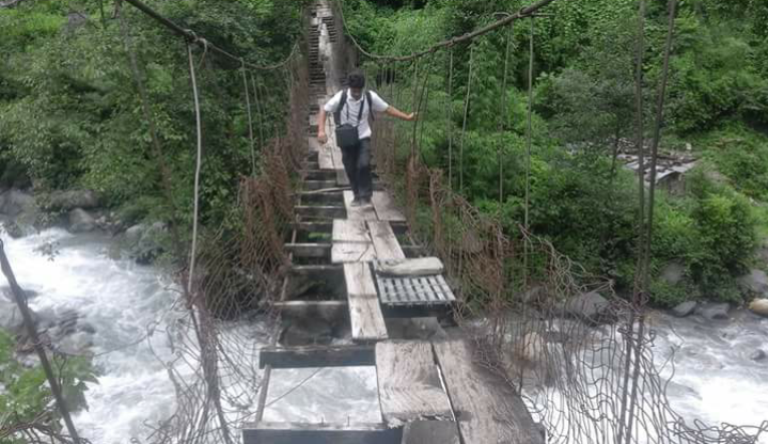 Baitadi –A suspension bridge at Surnaya Rural Municipality in Baitadi has been in dilapidated condition risking lives of people crossing it, but authorities concerned are less concerned. The bridge is the only means for crossing the Doleshwor river. Mohan Bahadur Bista, a local, said that the wooden planks of the bridge are decaying. Movements of the local people have been affected with the bridge in deteriorating condition since there is no other way to cross the river during monsoon, said Prakash Bhatt, another local resident. When asked, the rural municipality authorities said the bridge would be repaired next year.